After a week and a half of exploring the major Chinese metropolises of Beijing and Shanghai, it was time to head deep into Hunan Province for a taste of real China and its natural beauty. We caught a flight from Shanghai to Changsha and met up with our tour group, which would guide our every minute for the next 6 days through Hunan Province. 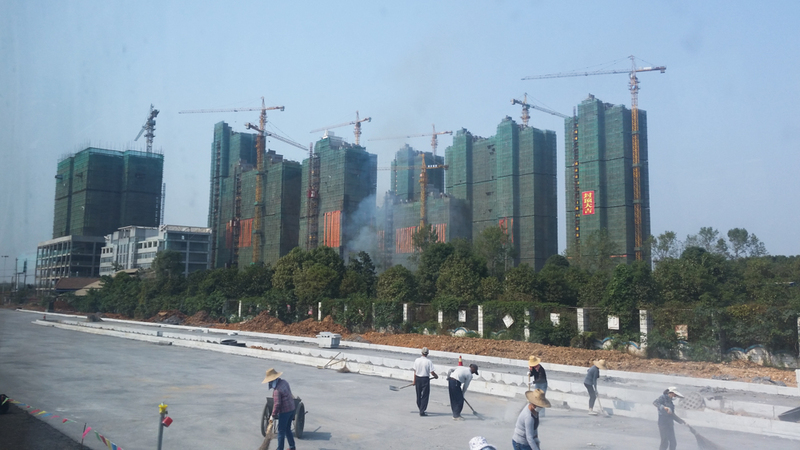 On the way into Changsha, a city being rapidly built and supposedly soon to have the world’s tallest building. At this point, a description of Chinese tour groups is in order. Our first taste had been in Beijing where Donna, Diane, and myself toured the Forbidden City & Great Wall and it turns out that the tour in Hunan would be like that but on steroids. In China it seems like everybody tours everyplace in these organized tour groups, and for us there would be no exception thanks to Jenny organizing everything for the rest of us. Wherever we went in touristy places in China we’d see a guide gingerly leading a large group of usually-but-not-always Chinese people around; you could spot a tour group from afar because the guide would hold up high a colored flag so that their flock can easily spot them. When you’re on a tour, you have absolutely no say in what the activities are as the guides stick to a strict schedule and don’t seem to understand the meaning of “I don’t want to do that”. My take on this is that in China people are less argumentative of authority, which makes sense given their political upbringing. The days would be long: you’re woken up from your slumber around 6:30 by a wake-up call pre-ordered to your room and then you’d get ready, eat breakfast and be off and onto the bus by 8am. Then the many activities would then begin and they really pack a lot into each day, usually visiting 2 or 3 different sights or shows, and of course also including some “shopping”…. What do I mean by “shopping”? Well, one good thing about these organized tours is that they are cheap. Our Hunan tour included 6 nights of upscale hotel stays, 3 meals per day, entrance to all activities, plus the bus — all for $600. ** The key to the low price is “shopping”, by which I mean that about one-third to one-half of your time will be spent going to activities that are really glorified sales presentations where they hope you will drop $$ on whatever it is they are talking about. We went to: a massage house where they rubbed our feet and tried to sell us various reflexology products, a tea house where they tried to sell us tea for 10x the price you could get it in a store for, a silk place where they showed us how silkworms make silk and then tried to sell us bedding, and a couple of places with awesome but expensive jade and pearl jewelry. The tour guide gets a 4% commission of everything you buy, which is actually his primary form of compensation — and in our tour some of the older Chinese-Americans went bananas and spent thousands of dollars, so I am confident our guide did well! To illustrate how important the shopping prsentations are to the whole operation: one time I hid in the bus because I didn’t want to go to a tea presentation and the guide flipped out on Donna and Mom when he realized I was gone because the vendors do strict head counts to ensure everyone they hope to sell to is present! All that being said, the presentations are actually fairly informative nice and the products are high quality and in many cases, like the silk bedding, much cheaper than you’d be able to find in the West. ** The shadiest part of the whole operation was that originally the price was $350, and once we were all on the bus for 4 hours on the first day, heading to Zhangjiajie, the tour guide informed us that to do “all” the activities, we’d have to cough up an extra $250, otherwise we’d be left out and forced to wait in the bus. And obviously these were the more desirable activities, not the shopping! People were pissed, including myself and many of the other tour patrons; it felt like a total bait-and-switch and I simply wasn’t going to let myself be screwed by some shady Chinese tour guide. But in the end, Jenny’s cooler head prevailed and she paid the additional money for Donna and I, correctly reasoning that this was likely the only time we’d be in Zhangjiajie and we should make the most of it. And the reality is, even after paying the extra $250 it was still a good deal when you consider the overall price of $600 was completely all-inclusive. A random photo from one of our many Chinese meals. In the end the tour in Hunan was awesome and worth it. Sure there were gruellingly long days, a shady bait-and-switch sales tactic, tons of forced shopping presentations, 3 meals a day of the-same-every-time Chinese food that left me not really wanting any more Chinese food, and a general feeling that you had no control over your schedule. Also the tour guide spoke entirely in Mandarin so my Mom and I couldn’t understand a lick, but fortunately we had Donna and Jenny to translate for us. But despite these gripes, looking back I realize I never would’ve been able to so many great Chinese places and pack so much into so little time, especially in a country like China where a laowai like myself is a lost guppy. 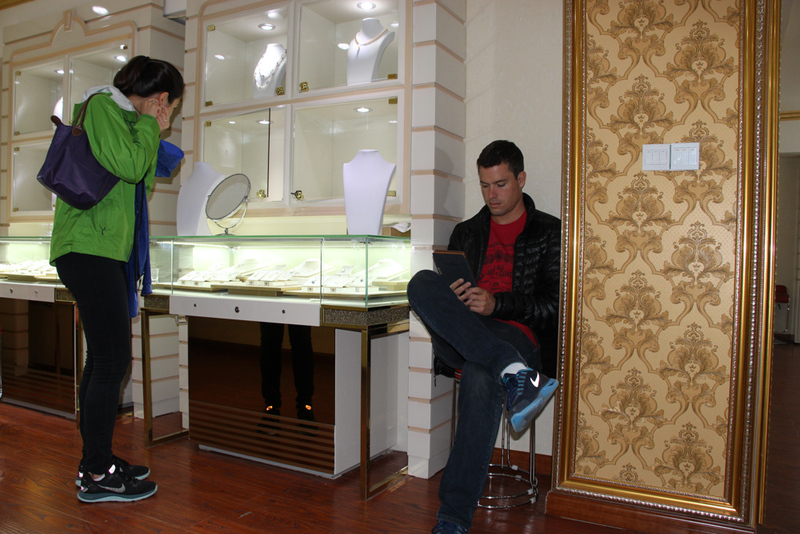 As the following photos will demonstrate, we saw many amazing places and took in real Chinese culture. Organized Chinese tours may not the way I prefer to travel, but like they say, when in Rome do as the Romans do, and in this case we “did China” like the Chinese do, and it was a great time! We flew into Changsha and stayed in a nice hotel in the area. There is nothing too awesome about Changsha, its just a big, rapidly developing city. 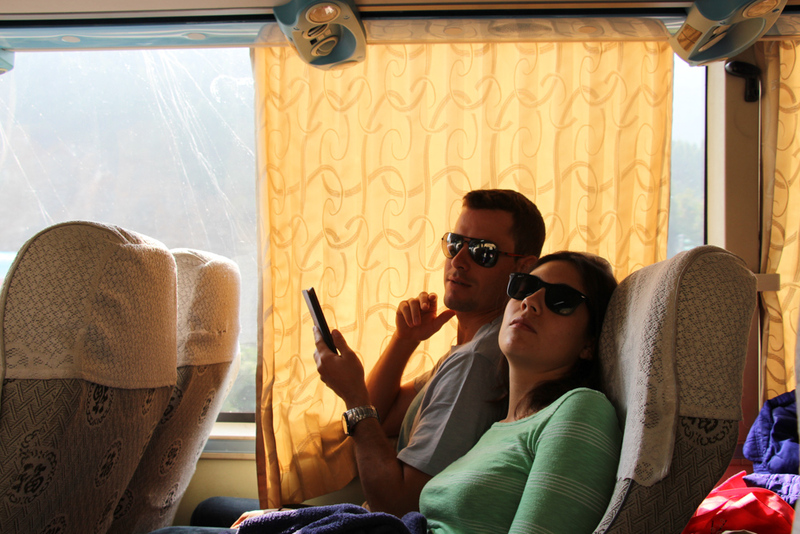 The next day we made a long bus ride to Fenghuang, arriving around dusk. The drive there was interesting because for much of of it we were on small roads and were able to see a more rural version of China. I was impressed with how clean and advanced the Chinese way of life seemed; I guess I was expecting everything to look more poor as it does, for example, in rural Latin America. Fenghuang is an ancient city built along a river on the western side of Hunan Province. At night, which is when we explored the waterfront, all the buildings are lit up and the city comes alive. Jenny, Donna, Mom and myself cruised around on a Friday night, checking out the shops, enjoying a drink, and taking photos of the cityscape. This is a parlor where “kissing fish” can eat the dead skin off your feet. I saw it and couldn’t resist giving it a try. It tickled like hell, but I made it happened… Donna was more hesitant but eventually fully submerged her feet as well. Crowds are never hard to find in China. A view from the bridge down the river. Fried crab on a stick, anyone? We had a drink on the water. At this store one could buy a pigs head, live geese, live guinea pig, live porcupine, live frogs, and live chickens. You could then take your purchased animal to the restaurant across the street and have it made into a meal. Lots of nighttime colors in Fenghuang. The next morning we got back on the bus and headed east to Zhangjiajie. When speaking to friends about what this place is, I would tell them I am going to “Avatar-land” because the National Park that we would be visiting there has unique limestone formations that inspired the “infamous floating islands of Pandora” in the movie Avatar. There were 3 main areas in the National Park that we would visit. The first was Tianmen Mountain, which accessible via a long gondala ride directly from the city of Zhangjiajie. At the top of the mountain we were able to walk around the mountain via a glass bottom walkway and then we descended to check out the famous Tianmen Arch, which is so big that the Chinese version of the Blue Angels (not sure what they’re actually called) have flown in formation through the arch! We descended back down via a windy road that I kept thinking about how fun it would be to race a Porsche up. The gondala ascent from Zhangjiajie town. The glass walkway above the mountains. It was kinda trippy walking on the glass walkway! Tianmen Arch. We all walked down the 999 steps from the arch to the bottom. Close up of the arch. This is a favorite for wingsuit flyers to soar through. Lone tree growing out of the rock near the Arch. The super curvy road that I thought would be great fun in a sports car. Yet another Donna and myself pic. The next day we checked out other parts of Zhangjiajie National Park. The first was Baofeng Lake, where we did a short hike that led us to a cool boat ride on a the lake surrounded by the classic limetsone mountains. After that the second spot we went was called the Wulingyuan Scenic Area. First we took another gondola to the top where we could view the epic limestone formations from the top. The weather was somewhat foggy which was kind of a bummer for the sightseeing, but it was still amazing. Then we took a bus to another area where we could view more and more of the formations. I felt like a Navi walking around the floating world! A cool boat ride through the mountains. In front of the waterfall at the end of a short hike. Donna and her mom in front of a statue of some famous Hunan Province general. Vertical panorama of the epic limestone columns. Mom and Donna made me pose in this shot! There were a few additional attractions we saw on our tour of Zhangjiajie. The Yellow Dragon Cave was a cool walking tour where huge stalagtites and slagmites were lit up in fluorescently colored lights. Also we saw a show at the Xiangxi Theatre that featured short performances with themes from various subcultures in Hunan Province. An interesting point about Hunan Province is that it’s where most of the Chinese minorities live today. 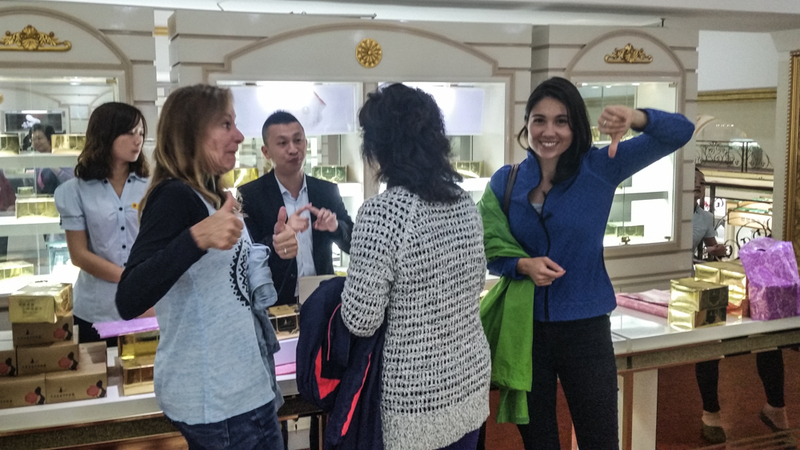 And of course we went to various shopping outlets, where the ladies were stoked on buying pearl necklaces and pieces of exquisite jade. At an art boutique Donna fell in love with sand tone painting technique pioneered by a local Hunan artist named Junsheng and I bought her a beautiful scenic painting depicting ancient rural life in the Zhangjiajie area, something we could take back with us and enjoy forever! Stalagmites lit up by neon lights. We descended this walkway and did a short boat ride through the cave. The performance ant Xiangxi Theatre. Donna was stoked on her first piece of fine art! The five days flew by and before we knew it we were back in Changsha and then on a flight back to Shanghai where we would spend only half a day. At this point Donna and I would break off and head to Singapore for INSEAD’s Admit Day, where we would tour the Singapore campus and meet her future colleagues. Meanwhile, my Mom would head back to southern California and Jenny would head back to New York. It was an amazing time in China and I feel super lucky to have experienced it with Donna and her Mom, who could translate and make everything so easy for me! My Mom and myself were stoked! Live bunny, fish, and other cute animals for sale — and we’re not at a pet store! Naw, we’re not selling those ads… I’m using the “free” version of WordPress.com for the blog, so I think they put those ads up to make some money off me!